Update 4-19-19 : Find the full update on our News page here. The commercial fishermen “cribbing” up the catch. Update 4-17-19: THIRD time is the charm! WHAT’S THE STATUS? Unlike the reliable USPS mail service, rain (thunder), sleet and (waist deep) snow WILL stop us from doing a carp seine. The commercial fishermen were ready today with their nets to go after the carp, but the weather did not get the message and released a plenty of thunder & lighting, thwarting today’s seining activities. ARE THEY DONE TRYING? Nope! The carp are still staying grouped up nicely in Crystal/Mud Bay and the commercial fishermen are going to (tentatively) take another shot at a seine on Friday. The semi truck will be out at the boat launch on Saturday to transport the carp to markets, and we are still crossing our fingers for a good haul. WHAT CAN I DO TO HELP? Please help the carp removal efforts by passing along the message to friends & neighbors that they should continue to keep boats and watercraft out of Crystal/Mud Bay until the carp have been completely removed on Saturday, especially on the southern end where the carp are grouped up. HOW CAN I GET UPDATES ON THE PROJECT? 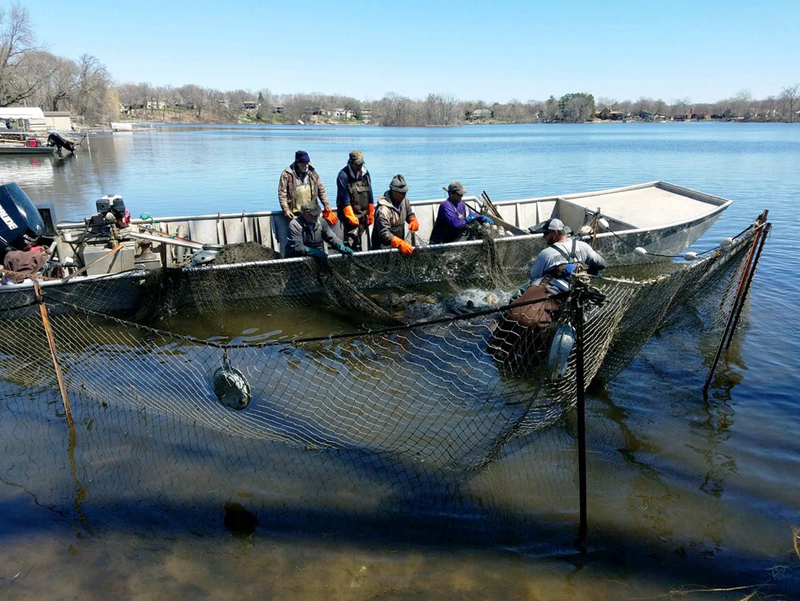 Email mkarschnia@plslwd.org to be added to our carp seine notification list to receive email updates or keep checking this page for updates. In addition, you can feel free to give us a call at 952-447-9808 if you have any immediate questions or concerns. The commercial fishermen pulling in the seine net on Mud Bay. 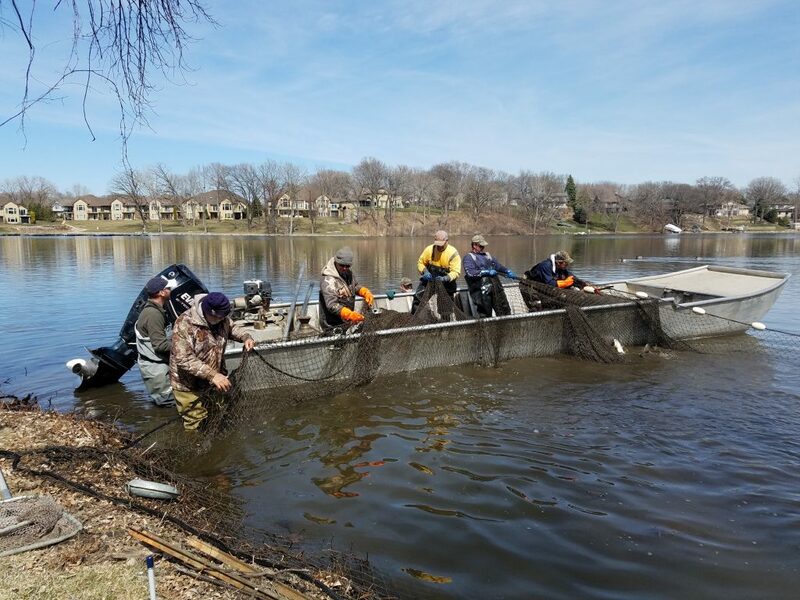 4-15-19 Update: A carp seine on Upper Prior Lake has tentatively been scheduled beginning Tuesday, April 16. A group of carp has been located in Mud Bay (a.k.a. Crystal Bay). If conditions remain favorable and the carp remain aggregated at this location, the commercial fishermen will be out on the water with their boats and nets to capture the carp and hold them in this location with their nets until the trucks are lined up and ready to haul them away later in the week. The carp are currently grouped up in Mud Bay (Crystal Bay). In order to ensure a successful seine, please refrain from boating or recreating in this area to prevent spooking the carp. The District is currently tracking the radio-tagged carp, focusing attention on Upper Prior Lake where the carp population is the highest. 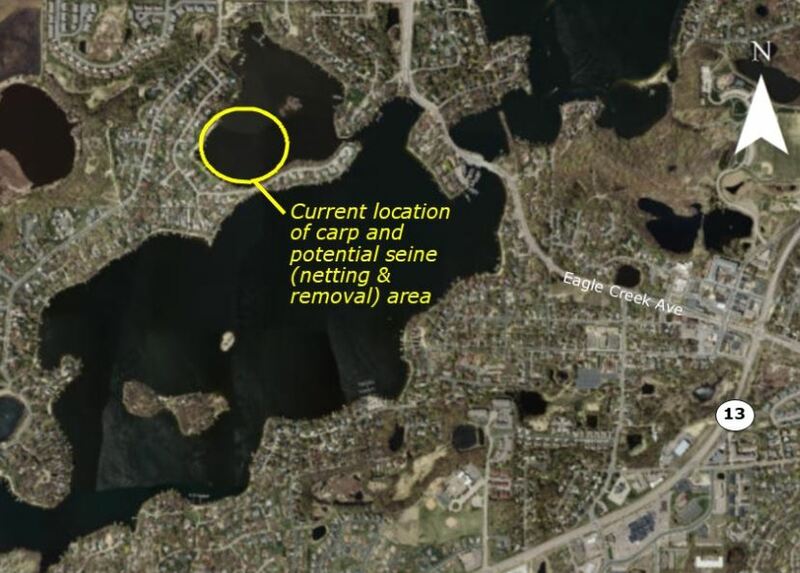 The carp population on Spring Lake is currently meeting the target population goal for the lake, consequently this year we are focusing efforts on Upper Prior Lake which still has a much higher carp population well above levels considered damaging to the lake. In order for a seine to take place, there are several factors which must all line up before we can go after the carp. 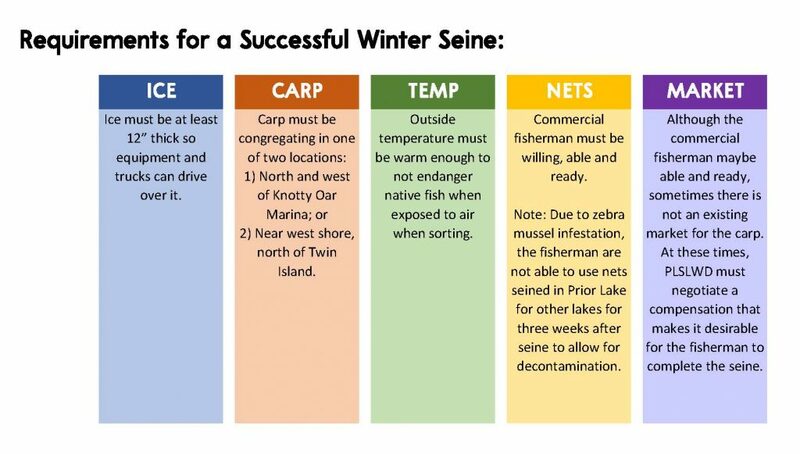 Unless all these conditions are met we cannot seine. For a successful open water seine, we must meet the same conditions as a winter seine, except that instead of suitable ice cover we need open water conditions. Open Water Conditions: Lakes are now ice-out. Carp Locations: Carp are currently grouped up in Mud Bay (Crystal Bay). Commercial Fishermen: Commercial fishermen are tentatively lined up for this week. Market: Market is currently available for carp. For more information visit our carp management program page.